BAe 1-11 501EX G-AWYV (c/n 178) at Rotterdam in April 1989. At one time it was a daily guest to my homebase Amsterdam IAP while operating for British Caledonian. Stricter EU noise regulations, effective 01Apr2002, meant the end for this "One-Eleven" and EAL had to ground it. European Aviation Air Charter Limited was formed in September 1993 for the Ad-hoc charter and UK Inclusive Tour markets. It is more commonly known as European Aircharter or European Airlines. BAe 1-11 530FX G-AZMF (c/n 240) at Bournemouth-Hurn 09Aug2000. "Mike Fox" shares much of the history of "Yankee Victor": it was also flown by B.Cal during the 1970s & 1980s and also became a victim of the new noise regulations; perhaps it awaits a future in Africa ? 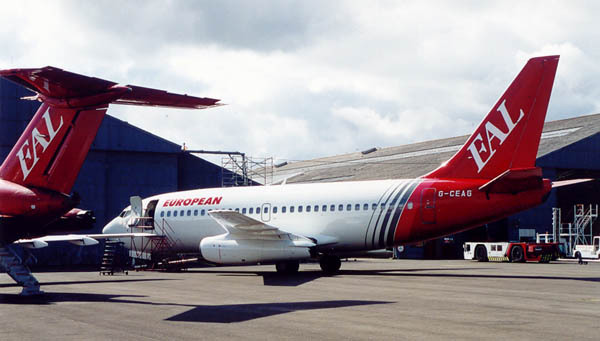 This colourscheme was introduced after the sparkly red c/s, but it was used next to the red colourschemes below as the end for the BAC 1-11s was in sight and no point in repainting them all. The interior of this "One-Eleven" was modified to accommodate "VIPs" ("Executive Air Charter") at some point. G-AZMF has been seen wearing "VIP First"-titles. Boeing 737-229(A) G-CEAG (c/n 21136/420) at Bournemouth-Hurn, 09Aug00. Boeing 747-236B G-BDXH (c/n 21635/365) "blue" at Amsterdam IAP, 13Apr02. European Aircharter a.k.a. 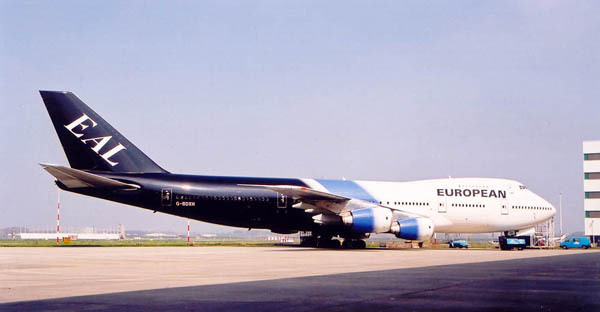 European Airlines bought a number of 747 from British Airways and changed to a new colourscheme; this was introduced in 2002. They went through maintenance with KLM at Amsterdam. Boeing 747-236B G-BDXE (c/n 21350/321) "red" at Amsterdam IAP, 13Apr02. 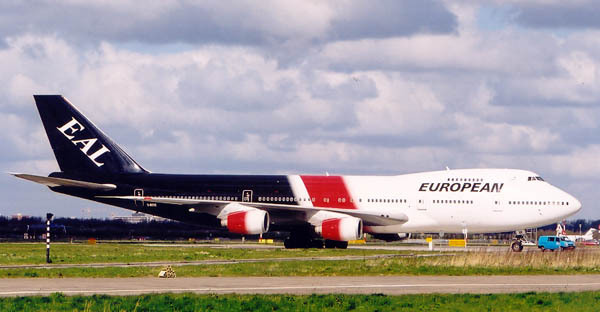 There were several 747s with a personal colour (e.g. "red", "blue", etc. ), which was quite a nice touch. At least one was used following the Minardi Formula 1 racing time of Paul Stoddart, who was until recently also European's owner and CEO. 1989 - 2001 Formed European Aviation Group which, from modest beginnings, employs 650 people in 2003, operating some 25 jet aircraft and one of the largest aviation parts supply companies in the UK. 1996 - 2001 Formed motorsport division (European Formula Racing Ltd), incorporating F1 facility, F3000 team, F1 two-seater programme (eight cars), engine development and overhaul facilities and, from January 2001, the Minardi F1 team. Boeing 747-236B G-BDXF (c/n 21351/323) at Amsterdam IAP (28Jun03) after maintenance with KLM. And then they spoil things ! Don't we have enough non-descript schemes like these ! This was introduced in 2003 and I don't like it much. The change probably had to do with an upcoming sale of the airline division to Bath Travel (Stoddart was to retain his ownership of his spare parts business). The Bath Family, in conjunction with other investors, has today exchanged contracts for the acquistion of the airline European Aviation Air Charter. Although completion is not expected until early in the New Year a substantial investment into the company has already been made enabling the airline to move forward. But..... P.Stoddart: "Unfortunately, after the proposed sale of EAAC was agreed in November 2002, the company embarked on a program of ambitious, but ultimately unsustainable growth overseen by a management consultancy. "When the proposed purchase recently collapsed, I felt I had a moral duty to step back in and try to ensure the continued survival of European Aviation Air Charter." This statement was made on 18Mar04. The European Aviation Air Charter airline formed (in 1994) and owned by Minardi Formula One boss Paul Stoddart was to shed some 560 jobs, around 90 percent of its workforce, as part of a drastic restructuring.... The Bournemouth-based airline said in a statement it was also reducing its Boeing 747 and 737 operations, to concentrate on flights originating from selected British airports. The slimming process would leave a staff of only 60 people. I like to thank Richard Bowater, Denis Norman and Paul Tomlin for their information.